I got an email yesterday from a reader named Jeff. It read "The was a cool room at SP when I was a kid, but I barely remember it. It was called the shadow room or something. You would stand up against a wall casting a shadow. A camera would flash and when you walked away the shadow stayed on the wall. Does that ring a bell?" The Shadow Room was one of the science elements at Sesame Place from 1980 until (at least) 1999. We entered a chamber called the Shadow Room. Of all the playthings I sampled and saw, electronic and otherwise, this one most took my fancy. You stand against a blank wall in the semidarkness and an overhead strobe erupts with a sudden flash. You step away and your shadow is still there, temporarily and vividly pasted to the wall. 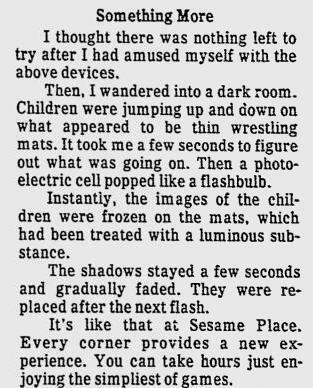 An article about the Texas Sesame Place said there was a two way mirror outside the Shadow Room so visitors (presumably parents of the kids in the room) could look inside the room. 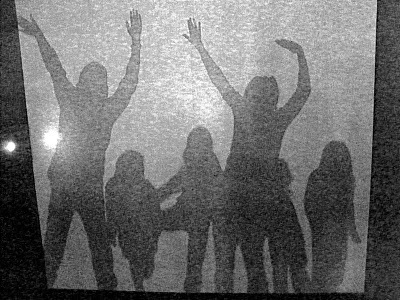 The trick to The Shadow Room was a phosphorescent wall. Think of it as your standard glow in the dark material. A bright flash of light shines at the wall. 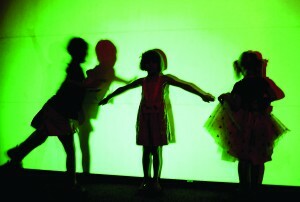 The areas of the phosphorescent wall, that received the light, glow. The areas blocked by the kids create the shadow. 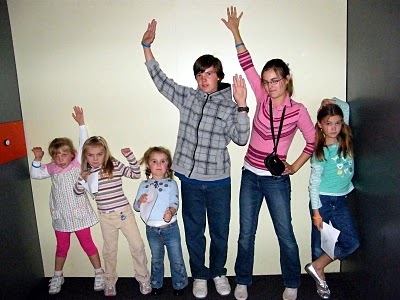 The Shadow Room was in Sesame Studio and was one of the last of the science elements to leave the Studio. It still remained until 1999 (along with Teleidoscope Temple and the food puppets) in the area that is behind the audience at Elmo's World. The area is now closed to the public. Thanks to Jeff for the email. PLEASE email me if you have any memories of this or anything else at Sesame Place! You can find an email link in the sidebar on the left.